There are prerequisites for this class. Please see description. MIG or TIG Welding #4 is the final class (of four) in the sequence leading to the use of the welding studio. Students should have completed Introduction to Welding #1, #2, and #3 for MIG or TIG. This class allows each student to design and work on a project of their choosing under the guidance of a professional welder. Your project should be the culmination of what you have learned in prior classes. 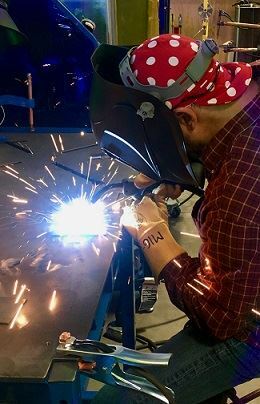 The class will give you the opportunity to fill any gaps in your welding experience or knowledge and to demonstrate that you have the skills to work independently in the welding studio. In advance of the class, each student should design their project, create a cut list and procure their materials. You will find a drawing to be helpful in communicating with the instructor. You can use this as a starting point for a project to be finished later in open studio or on your own. Students will need to bring the materials necessary to work on their project. There is a materials fee of $18 for 5 pounds of steel (from what is on hand), filler wire, gas, and consumables. Students must wear long sleeve natural fiber clothing, closed toe shoes, no stretch fabrics. Dress warmly, the studio may be cold.